Enterprise resource planning is a complex platform that incorporates many different applications, handles many different functions, and automates many different tasks. However, in order to be effective, an ERP software has to be built on a strong core. 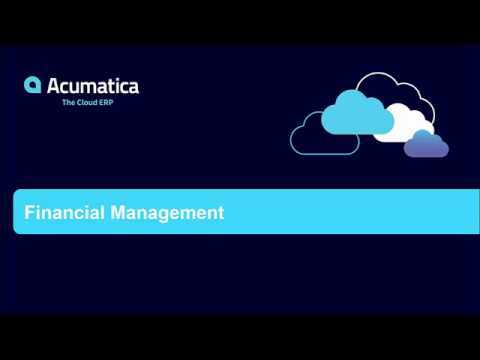 The financial management functionality from Acumatica is this core and can handle the needs of the modern business. Financial management is the basis for any enterprise resource planning application—without it, additional innovations such as modules and integrations would be all for naught. The financial management capabilities from Acumatica give businesses a full suite of accounting functions designed to track daily financial operations, generate quarterly and present annual financial statements. From small and medium companies who need the basics done well to large, complex, or highly regulated organizations in need of feature rich accounting functionality, Acumatica is able to grow, scale, and add functionality as needed, giving organizations the ability to streamline operations, get a single version of the truth, and access their software whenever and wherever they need it. The General Ledger (GL) is the primary accounting record for a business, designed to track all financial transactions and generate the company’s financial statements, including the Income Statement and Balance Sheet. Fully integrated with the rest of the Acumatica suite, the GL functionality gives financial professionals instant access to financial data and automates reporting and analysis of ledger accounts, income, expenses, and assets. Acumatica’s Accounts Receivable software helps you generate invoices, send statements, collect and apply payments, verify balances, track commissions, and deliver customer reports. This accounts receivable solution is fully integrated with all other Acumatica modules. Acumatica Accounts Payable tracks money owed, available discounts, due dates, and cash requirements anytime, through any web browser. Align payments with cash flows to maximize discounts while minimizing late charges. You can also use drill-down reports and dashboards to help predict cash requirements. Manage your cash needs with ease. With Acumatica Cash Management, integrated with general ledger, accounts payable, and accounts receivable, you can establish a single place to manage all of your cash needs. From summarized overviews to granular account data, you can make reconciliation easy, simplify and secure account transfers, and see the entire picture. For the international business or aspiring one, you need to be able to get a complete view of your money—no matter where it is. With currency management from Acumatica, you can quickly and easily conduct business globally using advanced currency management features to support international subsidiaries, vendors, and customers. Taxes are a fact of life. With each locality, state, and country having different codes, however, you need to adapt to each. From VAT to sales tax to withholdings, Acumatica Tax Management has you covered. Acumatica Tax Management gives you the ability to configure, collect, and report taxes, automatically adjusting to your locality and integrating with other modules so that you never get blindsided. Whether you’re receiving scheduled payments or if you have deferred expenses, managing this process manually is a hassle. Thanks to Acumatica Deferred Revenue Accounting, you can simplify the management of both inbound and outbound money, calculating the numbers across your ERP and automatically posting and recognizing deferrals in financial statements. Further, this is customized to your unique business needs and schedules. If you’re operating multiple locations or companies, consolidating data can be a challenge—especially when you’re balancing this with multiple tax codes, currency requirements, or calendars. With Acumatica Inter-Company Accounting, you can track financials and automate reporting, inventory transfers, vendor, payments, cash management, and inter-company transfers across multiple related companies. Depreciation is a challenge—no matter how skilled the person working on it. With many schedules, tax considerations, and reporting needs, keeping track of your fixed assets is a still a necessary part of business. Thanks to Acumatica Fixes Asset Management, you can easily track your fixed assets, adding them directly from AP purchases, importing them from a file, or adding them individually. Better yet, you can set up and track fixed assets easily, selecting from a large pre-defined depreciation inventory or creating custom schedules. Whether you’re on the other side of the country, the other side of the world, or just home sick with the flu, if a decision needs to be made, you need to be able to make it with all the available information. Acumatica Mobile ERP is an Enterprise Resource Planning system that can be accessed through mobile devices, such as mobile phones and tablets. Get secure remote access with iOS or Android apps, or by using any browser. With anytime, anywhere access, modules to suit any industry, and easy-to-use integrations, Acumatica is one of the leading ERP options for businesses today. Whether you are looking for security, access, performance, support, or flexibility, Acumatica has you covered. Sold only through a selective network of implementation partners like MIBAR, you can trust that you’re getting not only the technology you need, but the service and support you deserve.